"There were times, Frank, when I thought this day would never come, but it had to, for in my mind I had promised you that the job would be done." 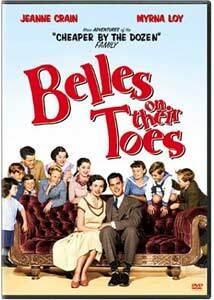 Following up on the success of 1950's Cheaper by the Dozen, its sequel, Belles on Their Toes, picks up where the first left off, in the continuing story of the Gilbreth family. Helmed by Henry Levin (Where the Boys Are) this followup was again based on the novel of the same name by Frank B. Gilbreth Jr. and Ernestine Gilbreth Carey, whose parents pioneered the field of industrial engineering in the early 1900s. The film opens with the graduation of the youngest daughter, a time to reflect on all that has happened since we last saw the Gilbreths. With the death of her husband, Lillian faces an uncertain future, made more complicated by having sole responsibility for her brood of twelve children. Their new situation means many adjustments to keep the family budget, since despite her husband's credentials and her equal part in his research, the early twentieth century has no place for a woman in the sciences, and she faces discrimination from the industries and engineering societies utilizing their life's work. Lillian must rally the help of her children to make ends meet, and overcome their many obstacles to keep their family together. With her children now grown up, the reality of their outside interests also come into play, adding another layer to the choices needed to maintain the familial integrity. Myrna Loy, Jeane Crain, and Barbara Bates return as Lillian and her daughters Ann and Ernestine; the cast is strengthened by the addition of Debra Paget, who plays the spunky, grown up Martha Gilbreth, and Jeffrey Hunter, who comes aboard as Ann's love interest, Dr. Bob Grayson. Hoagy Carmicheal hams it up as the family's houseman, Thomas George Bracken, and Edward Arnold makes an appearance as Sam Harper, a wealthy industrialist reluctant to enlist Lillian's expertise in streamlining his operation. Robert Arthur rounds out the older children as Frank Gilbreth Jr. The humor and family antics are still in abundance, and the challenges facing a family of this size make for an entertaining viewing experience. The original film was a bit uneven, but Belles on Their Toes provides a stronger, more focused direction. Unlike Cheaper by the Dozen, Belles starts out as a quasi-musical, immediately giving it a different feel from its predecessor, and while the story could have revolved solely around Lillian trying to gain acceptance in a man's world, the adaptation puts Ann front and center in her romance with the young doctor, which also sets it apart. Lighthearted with some semblance of drama, Belles on Their Toes is a heartwarming sequel that bests the original, which is not totally forgotten as the story pays tribute to Frank Sr. in its closing moments. Image Transfer Review: Image quality is quite good overall, but it does get off to a rough start. Color is well saturated, black levels fine, and detail is for the most part quite good, with only select scenes looking a little too soft for my liking. Aside from the opening, which contains a great deal of green shadowing in the image, there are limited defects in the source print, most of which are minor. A bit of interlacing was evident in places. Audio Transfer Review: English audio is available in stereo or mono, though there is little discernable difference between the two, other than some faint imaging width. Both exhibit a deficiency lack of clarity in the high end, and are somewhat oversaturated and mildly distorted. Tonal balance is adequate and dialogue is easy to discern. Not the greatest, but serviceable. A Spanish audio track is also present, which is a bit more focused around the midrange. Extras Review: Extras include only the original trailer, and those for the 1950 version of Cheaper by the Dozen and its 2003 Steve Martin remake. The sequel to the hit Cheaper by the Dozen is an upbeat family comedy, with an added musicality and central love story. Due to its more even nature, Belles on Their Toes makes for a better picture, but would not have nearly the same appeal without having first seen the original film.